Is Your Business Ready for Microsoft Office 365? When we own a company, we look for technology solutions that are ‘do-it-all’ in themselves, so that we get the freedom and flexibility to perform our day-to-day activities without investing a heavy amount in supporting solutions and technologies for a particular tool/solution. Is employee productivity a worrisome issue for you and you want to give them tools to enhance their productivity? Do you have remote workers? Do your employees require office docs anywhere on the go and want freedom to access them from devices of their choice? Do you wish to use latest technology –like cloud based business communication tool? Do you want to get worth of each penny you spend? Do you want the best security for your organization’s data? Are you spending a lot of moolah to buy and manage multiple software for internal-external communication and on off-site business meetings? Do you wish to go green – support the paperless office? If you answer yes to most questions above, it’s high time, you consider Microsoft Office 365 – the cloud based business productivity solution for your business. Files can be accidentally lost by manual error, virus attack, or a complete hard disk failure. To protect data, a backup is needed – with anywhere and anytime access. Now-a-days, an employee goes places for professional reasons and works on various devices – laptops, tablets, smartphones from anywhere as per convenience. In case of remote workers, this mobility becomes all the more essential. So a solution is needed that provides one with freedom to work from anywhere and on any device. In today’s fast paced business scenario, one needs to connect with customers professionally and so there’s this need to have business class email on one’s own domain. ([email protected]). Any business that invests in a solution, keeps in mind that the solution it has taken should scale up as per its growing needs. Same is the case with the communication solution – there should be the capability to add more accounts or increase the storage space and such as per the needs of the business. All the things discussed above are provided by MS Office 365, in addition to providing the basic much-known productivity tools online like Word, Excel, Outlook, and PowerPoint, and also the ability to work from anywhere and with any device of your choice. “It has become appallingly obvious that our technology has exceeded our humanity.” – AlbertEinstein. 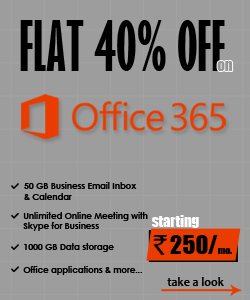 Office 365 connects your business ecosystem irrespective of its size, location or budget. The low cost business communication solution based on cloud, makes available all the right toolsto take your business to new heights. The most economical business communication solution: Recently, ZNetLive has reduced the prices on all its plans – so a good amount of savings as compared to O365 plans offered by other providers. 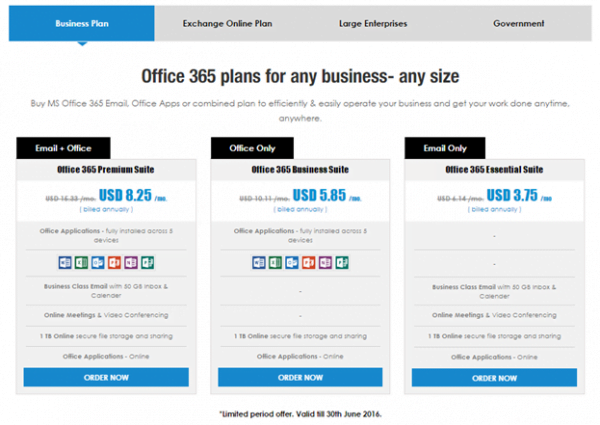 J Image below shows just an inkling of our Office 365 plans and pricing. You can check all plans and prices here. The special price offer is valid only till 30th June 2016. 2. Microsoft Office 365 is completely cloud based: This enhances productivity, frees your IT resources, decreasesmaintenance tasks and frees you from hassles of keeping your IT framework up-to-date. It makes things simple for the end user to access Office 365 anytime and anywhere on any device with just an internet connection. A great example of this is when someone leaves for vacation and forgets to set their Out-of-Office message.With Office 365, employee can simply login to the web portal from anywhere and set the OOO message and whom to contact, so the others get to know that they are out.Click here to know more. 3. Reliability and security: Microsoft Office 365 guarantee ensures that there’s no need to worry about losing access of what we need and when we need it. Also, it comes with anti-spam filtering and anti-malware protection. 4. Ease of migration: ZNetLive team can easily migrate your complete datato Office 365 with personal support and attention and will also provide answers to your queries 24X7. Move to O 365 today to make your business more productive, connected, efficient and agile. Need any more reasons to move to Office 365?